When selecting a retractable, clamshell, or lift door industrial parts washer, one of the most important decisions is the diameter of the turntable and the load capacity. 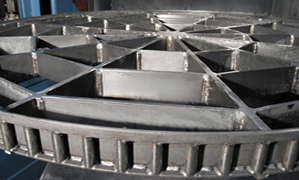 The parts washer turntable must be able to support the parts for loading and during the cleaning cycle. StingRay's heavy-duty construction and sprocket driven turntable system offers one of the largest selection of turntables sizes and capacities in the industry. The chart below compares MART Power Washers and Proceco Parts Washers with StingRay Industrial Parts Washer turntable sizes and load capacities. Our heavy-duty turntables are designed to be driven with a thermoplastic sprocket that provides constant contact with the turntable's welded pins.